In this BIOLYFE newsletter issue, we would like to provide a brief report on the first BIOLYFE workshop that was organised on 7 June 2011 in Berlin, Germany. Within the BIOLYFE project, three workshops on lignocellulosic ethanol production will be organised. The first BIOLYFE workshop focused on sustainable feedstock sourcing and energy crop production. The production of energy crops and the sourcing of agricultural residues at a larger scale is one of the critical steps in implementing environmentally and economically sustainable supply chains for lignocellulosic ethanol. However, large-scale agronomic experience is rather limited regarding lignocellulosic feedstocks. This workshop aimed at exchanging existing experience and at discussing factors influencing the sustainability of the resulting supply chains. 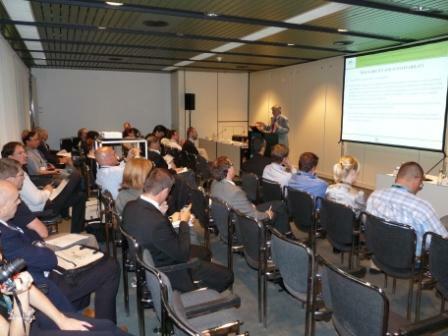 This workshop was jointly organised by WIP Renewable Energies and Chemtex Italia, as a side-event of the European Biomass Conference that took place in Berlin from 6-10 June 2011 (www.conference-biomass.com). Fabio Sissot, Bioenergy Senior Expert, Agriconsulting S.p.A. Please see brief summaries of the presentations below. Workshop participants were welcomed by the workshop organisers Rainer Janssen (WIP Renewable Energies) and Arianna Giovannini (Chemtex Italia). The first presentation was given by David Chiaramonti on behalf of Chemtex Italia as the BIOLYFE project coordinator, providing an overview on BIOLYFE activities and preliminary project results regarding the industrial-scale production of second generation bioethanol. Mr Chiaramonti started with an update on the production and use of biofuels in Italy, where the BIOLYFE second generation ethanol plant will be constructed. While the current use of bioenergy in general and of biofuels in particular is rather limited in Italy, the Italian government has set quite ambitious targets for bioenergy and biofuels use in 2020. This situation creates market opportunities for technologies for efficient biofuel production. Previous R&D work carried out by Chemtex and several partners led to the development of the PROESA (TM) process, a combination of technologies for the efficient pre-treatment of cellulosic feedstocks and further viscosity reduction. Mr Chiaramonti presented key features and advantages of this technology that will also be integrated in the BIOLYFE industrial demonstration plant for second generation bioethanol production, together with innovative concepts for hydrolysis and fermentation resulting from the R&D carried out in the BIOLYFE project. Anselm Eisentraut from the IEA Renewable Energy Division presented an overview on recent work done on biofuels within IEA, with a focus on the potential and perspectives for sustainable second-generation biofuels. The work presented includes a recent study on the "Sustainable Production of second-generation Biofuels" estimating current and future potentials of second-generation biofuel production from biomass residues. Mr Eisentraut also presented the recent IEA Technology Roadmap on Biofuels for Transport which suggests that global biofuel supply grows to 32 EJ in 2050 (from 2.5 EJ today) with a considerable contribution from advanced, second-generation biofuels. The Roadmap assumes the use of 1 billion tons of residual biomass for biofuel production in 2050, which will be complemented by the use of dedicated energy crops. Fabio Sissot from Agriconsulting presented the experience with Arundo donax production gained within BIOLYFE. For the BIOLYFE project and the planned second generation ethanol production site, Arundo was selected as the most suitable energy crop. Mr Sissot explained the procedure of rhizome production and harvesting, as well as the cultivation of Arundo for biomass production. The main advantages include low need for fertilization, water and weed control. Biomass can be harvested over a life cycle of 10 years with a productivity of up to 20-30 tons of dry matter per hectare and year. Arundo is a promising alternative for local farmers, especially on marginal lands. Finally, aspects related to the traceability and sustainability of this crop were presented. Anton Sieverdingbeck from Sieverdingbeck Agrar presented his practical experience with Miscanthus cultivation. Aspects discussed included the crop´s requirements on soils and water availability, weed control and fertilizing strategies, as well as economical calculations showing the competitiveness of Miscanthus as compared to traditional crops such as winter wheat. Currently, Miscanthus is mainly produced for heat and power applications, as animal bedding or material use. Aigars Olukalns presented the experience gained with the cultivation of Switchgrass and Reed Canary Grass in a project for the Latvian company Latgran, in which energy grasses were produced as feedstock for pellet production. Practical problems reported were mainly related to negative climatic impacts and to storage and logistics. However, this experience should be taken into account by other projects intending to cultivate Switchgrass and Reed Canary Grass. Joachim Möser from Saaten Union presented his view on the use of straw as energy source. Mr Möser pointed out that current methods of estimating straw utilisation potentials yield largely variable and inconsistent results. Therefore, he presented a field experiment on the question how much straw can actually be harvested from the field without causing imbalances to the humus content. The field trial revealed the influence of several parameters (wheat variety, fungicide treatment, harvest dates and harvesting procedure) on straw yield and residue formation. Aleksandra Rybczynska from Bloomberg New Energy Finance presented results of a recent study on Next-generation biofuel value chain economics. Also this study identifies straw as the main agricultural residue to be used for energy purposes, with supply cost curves showing wheat straw from France, Germany, and the UK being most cost competitive. The study furthermore compares the operational expenditure for the production of liquid bioenergy carriers via different conversion processes and the related revenues and profits per tonne of feedstock.